I am a programmer at my day job, but I've always been interested to learn how to draw and design. Even in my programming world, I tend to pick up tasks that are related to UI or UX. Now that we're building Bloggie and all of us are programmers, we are in a dire need of a person with some design skills. So far we've been using a free logo, but the problem is that if I do a Google Image Search, I can find many others who are also using this logo. So I decided to take a stab at creating our own one! To begin my logo design journey, I bought Sketch and Adobe Illustrator. Now I'm ready to design a great logo ! Next is to come up with an idea. Should it be a letter 'b'? Should it be some shapes? But I feel like I'm not heading towards a good direction. So I decided to put it on pause and do a little bit of thinking. But wouldn't it look too similar to Beat's headphone's logo, 'b'? maybe a triangle? perhaps too random? maybe a random shapes, as long as it looks cool? Should the logo be relevant to our product? maybe a pencil, since we're a blogging platform? maybe a terminal, since it's target users are programmers? Should I just use the entire word as the logo? What colors should I begin with? Is it good to have a character as our logo, like Github? The more I consider, the more confused I am. I don't know where I should be heading. So I thought, maybe I can learn by looking at the others. I begin googling up all the famous brands. Got to learn from the masters! A logo can be a single character McD's "M", Medium's "M"
WIL: The character M is used for both of this companies, but I never thought about Medium when I looked at Mcd's "M", and vice versa. Then I also realize, I never thought of "B"logger when I look at "b"eat's headphone's logo. A logo can be a word, such as "Amazon", "Intel", "Samsung"
WIL: I thought that using a word will be easier, but I tried and found out that typography is actually harder than it looks. WIL: They are all very simple and straightforward! I wondered maybe logos are all about simplicity? But I do remember some fancier logos. They are all pretty fancy! I've already got some answers to my initial questions, but it's not good enough, there're some unanswered ones still. So I continued on the next question: "what style should I use? Flat Design?" So I decided to took a look at the style of bigger brands again. I noticed that the logo started from less details to more details, and eventually to almost no details. The latest logo consist of only shapes (eyes and legs disappeared). The apple logo evolution is almost the same, where it went from very detailed graphic into a colorful one, then into a glossy one, then into simple black. It then somehow repeated itself into a glossy one, and once again back to the simple black. The windows logo started with very little details, then evolved into a more detailed one, then glossy, and back to a simple four-color-logo with a modern feel. The Google logo evolution started out with gradients and shadows, it then became flat without the details. By looking at the logo evolutions of these companies, there is a very noticeable trend. All of them has more details 10 years ago, and slowly evolved into a logo with a much flatter design. You can google up "logo evolution" and see more results of such evolution. WIL: The style of the logo is more or less determined by the current design trend. When the logo follows the current design trend, your brand will look more reliable, because most of other notable services have a similar style. WIL: Every logo has a story of it's own, if you google up each of the notable brands, you will be able to find their stories. The meaning of the logo always remains even the style changed over the course of a few decade (For example: Samsung Logo). I noticed that some companies provide a family of similar products and they use a very smart logo that can be adapted into various logos to represent a wide range of products under the same family. There are some services that use a character as their logo. What's interesting about having a character is: it can be used for logo adaptation too! Look at these cute little Reddit characters used for different Subreddits! Github on the other hand doesn't really use their character for their different services, but it's really has a good ability to be adapted into anything. These are all fan created. WIL: There really isn't any rules when it comes to logo design, when there is a need, the logo design can be tweaked to fulfill the need. See how creative people are to adapt their logos into a big family of logos. WIL: While character is fun, it is harder to design one as a newbie in designing. Besides, Favicon can be a problem since a character has so much details, we need to discard a lot of details to make it much simpler. We also need to think of the app icon which has to be much simpler due to screen space constraint. Github uses a silhouette version, Hipmunk uses a pixelated version and Reddit uses an outline version of their logo. Answer: The uniqueness factor of a 'single character' logo lies visually, less so about the character itself. For example: the character "M" for McD is never confused with Medium's "M". The Blogger's "B" is never confused with Beat's headphone's "B". Answer: I seldom find logos to be a random shape, it can however be a valid shape, like Nike's tick, Apple's apple. Answer: Not necessarily, many product logos don't directly relate to their services. But all logos have a story or underlying meaning. Answer: Logo can change drastically. In the case of Instagram, Apple, Windows, the color of their logos had changed completely in the past. I decided to draw my logo in black color and color it with our theme color once we've decided on one. Answer: In Logo Evolution section, we've seen how logo style evolved to fit the trend. I decided to go with the trend and use a very simple design and flat colors. Back to my original intention of designing a logo. 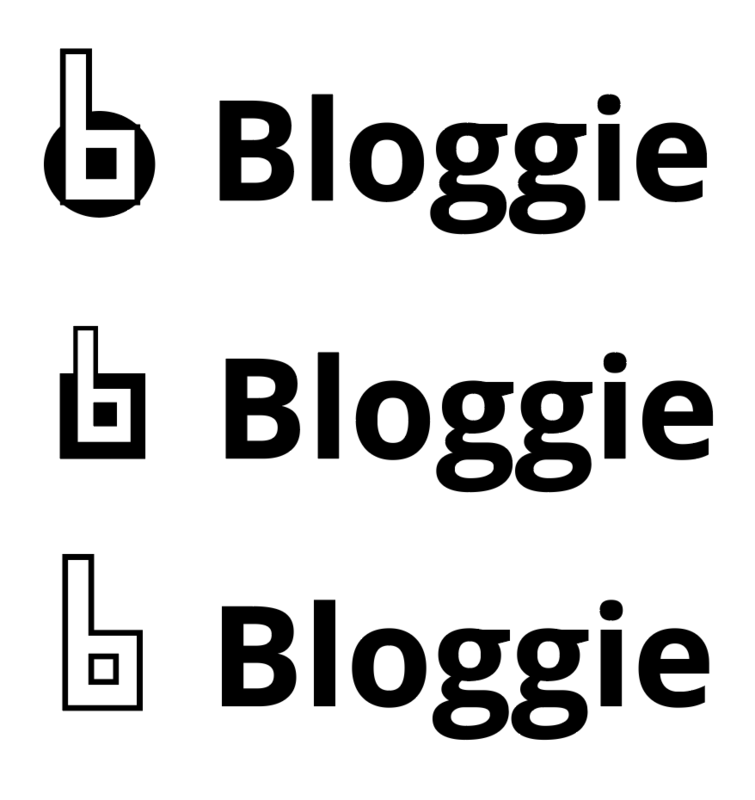 Here's my failed attempt by trying to use Typography to create a fun "Bloggie" art. Typography is harder than I originally thought and I realized that I know nothing about it. After a couple of failed attempts and trying to find answers for my own set of questions, I decided to try out using a single letter 'B' or 'b'. Remark: This looks simple enough, but looks too similar to Beats logo. Remark: It doesn't look nice. Remark: Better, but it doesn't look too good either. But I feel like I'm on the right track, so I kept going in this direction. Finally, I have a good feeling on some of them! We still haven't decided on which one yet, but I feel like we are in the correct direction! That's all for now, I hope you learned a thing or two from my experience. If you are a complete beginner like myself, hopefully you have a better idea of which type of logo you can start with. Also, please feel free to share your ideas of what can be a good logo for us in the comment!